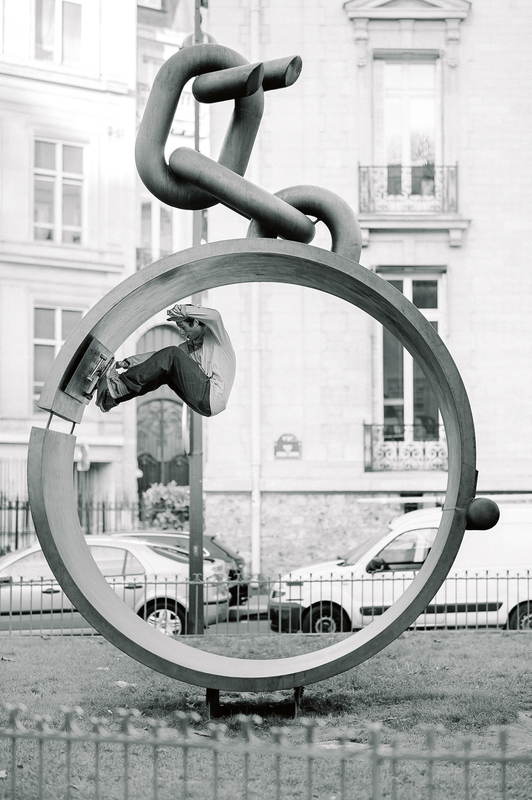 Pivot to fakie, Paris. Ph: Thibault Le Nours. I am not sure how to introduce Martino, what I am sure of is that I am happy I can introduce him. I am glad that I can share with everybody what is probably one of Switzerland’s best-kept secrets. Martino is one of those guys that, despite being a nice mellow guy and being incredible on a board, for one reason or another managed to stay under the radar. I am sure that anybody reading this can think of a similar example in his or her own town or city. It’s the same old story. You start skating in your town and there is this one kid who is way ahead of everybody else and he’s also a really nice guy so everybody likes him. Then for one reason or another this guy stops skating or things don’t work out for him and he becomes this urban legend, ‘the guy that was better than everybody else but never made it’. You would talk about it with your friends and share his story with the new kids until this guy becomes some kind of myth.Well, Martino was on his way to becoming that guy but I guess thanks to today’s social media and Martino being the amazing skateboarder that he is, things may turn out differently in the end. This interview is definitely a step in the right direction. I am glad that I can talk about him via an interview and that I can share with some more people than the Lugano locals (which are not that many) some insights about this amazing skateboarder and overall nice guy. Incidentally the fact that he welcomed me to his house to get this interview done with a cast on his foot and crutches is not necessarily a step in the right direction. Martino Cattaneo: I just had surgery on my foot. A couple of weeks ago I twisted my foot in a weird way. At first I thought it was nothing serious, but the day after I went to the doctor and anyway and it turned out I’ve got myself a Lisfranc injury. At the beginning I didn’t want to get surgery because they told me there is a possibility to heal it, but I realised it was the best thing to do. So now I just have to wait a couple of months, then do rehab and then I’ll be back 100%. Ollie, Bülach, Switzerland. Ph: Alan Maag. Of course it wasn’t good news at first but I am trying to stay positive and I am sure that getting surgery was the best thing to do. The bright side of it is that the injury got discovered. I could have easily waited some time more, not done anything about it and gone around complaining about the pain in my foot. What about your ‘skate career’? I was filming for a video part that I was hoping it could come out with this interview so I am kind of bummed that I couldn’t finish that on time and that I have to pause everything for a few months. In the end it’s not that bad. People have been supportive, and I don’t feel any pressure, so it’s all good. When will you be good again? I am not sure yet, probably around November I can start to do some physical stuff but I guess I’ll be back on board 100% around spring. I am going to work in a retirement home for a couple of months. I like the job, it’s mellow and it leaves me a lot of free time and energy. But after that I am planning to look around and try and do something that I might pursue as a career, something that doesn’t have anything to do with skateboarding. I think I would like to do something that allows me to do some physical work, and to spend a lot of time outside. I have always had the need to be physically active, in school I would easily get restless. If my foot is good enough to endure physical labour I might try to work as a silviculturist, I would take care of woods, trees and mountain paths. It’s something I see myself doing when skating will take less of my time, so I think it would be cool to get an insight of it while I am doing rehab for my foot and I can’t be 100% focused on skating anyway. But we’ll see, I am a bit scared of routines and I don’t want to put pressure on myself. I also considered going to build skateparks. I already did that a few times and it was a really good experience. I really like being a part of the process of building a skatepark from scratch. It’s physical labour but you also need a bit of imagination to have a full vision of what you are doing. You have to be able to imagine how the little work you are doing at the beginning is going to influence the final result. Skatepark building is also very good because of the crew; I have always worked with skaters and generally cool guys and that makes the job even more likeable. It could also be a good option during rehab time. It will get me close to skateboarding without leaving me the time to actually do it too much. But we’ll see, for now I am just chilling at home with a cast on my foot and I spend a lot of time cooking. True. You are vegan and you really pay attention to what you buy and eat right? Why did you make this choice? I’d rather say I am ‘plant based’; it’s more accurate. I pay a lot of attention to what I eat but not that much to what I wear, so I am not really vegan. Anyway, I became vegetarian when I was 17, after awhile I stopped drinking milk and eating milk derivatives. At the beginning I made this choice because of ethical reasons; I didn’t want to support the meat industry in any way. I really believe that the meat industry is consuming a lot of unnecessary energy and is really damaging our ecosystem. But after a while being vegetarian also made me feel better physically and I realised it was good for my body. Since I’ve stopped eating milk derivatives I stopped having pollen allergies and now for me it’s just normal to only eat plants; it became a habit. Let’s talk a bit more about skateboarding. I feel like this last year your ‘career’ kind of boosted a bit. Why do you think that it is happening now and it didn’t happen before? You’ve been around for a while now. I don’t know, frankly I was working and skating and I wasn’t expecting anything to happen so maybe I wasn’t doing anything to really boost my career before, I was just taking things as they come. I guess it happened now, because after working pretty much full-time for two years, I was really over it, so I started to work less, and skate and travel more. Then one thing led to another and this year I ended up going on a couple of Vans trips, and getting a bit more noticed. I think I also owe it to some friends that helped me in many different ways. Anyway I am really glad I got to join these trips; I like to skate big things or things that scare me a bit for one reason or another, and travelling with skaters of a certain level gave me the chance and the motivation to skate this kind of stuff. It’s kind of hard to get some tricks on a huge bowl when you’re on a homie trip and you’re the only one skating it. Don’t get me wrong, those trips are fun but I needed something else. More than just my career I feel like this last year or so boosted my confidence; I believe more in my possibilities and in my skills. Switch nosegrind, Hanover. Ph: DVL. You should have confidence; I don’t think that anyone could argue your talent on a board. Did you ever feel underrated? Not really, as I said I was just working and skating, I didn’t think about skateboarding in those terms. Plus I knew I wasn’t really putting myself out there. I didn’t have any part out or coverage in magazines, so I wasn’t really expecting something to happen. Also every time I would leave Lugano for a bowl contest or something I would see these other guys that were way gnarlier than me, especially when I would go skate some big bowls. We don’t have any scary transition around here so it was hard for me to skate big parks, being in Lugano was also making it harder to produce coverage. Yeah I guess Lugano didn’t help… Why stay there then? I don’t know, probably I just didn’t have the right excuse to move until now. But now I really feel the need to move somewhere, I’ve always lived here; it’s time to see how life is somewhere else. I am fascinated by some cities of northern Europe, in particular Hamburg and Copenhagen, I might give it a try soon. Lugano is nice, life here is mellow and I am surrounded by a group of cool people that make it an interesting place. Unfortunately it’s not the best place to be a skateboarder in: there are not many people to skate during the week, not to mention the difficulty to find somebody to film a trick with. For this reason and for the sake of discovery I think it might soon be time to move. Before this year you also went on a couple of Witchcraft trips, I guess that also helped you get to skate big parks and get more confident on and off the board… How was that? It was really good. I got to skate with a very cool crew that had similar tastes to mine concerning spots. Unfortunately it’s a very small brand. At the beginning of the year they told me that it would be better for me to look around and search for something else since the budget was small and they could not afford to send me on trips or support me in the way they would like to. That was really cool and honest of them. 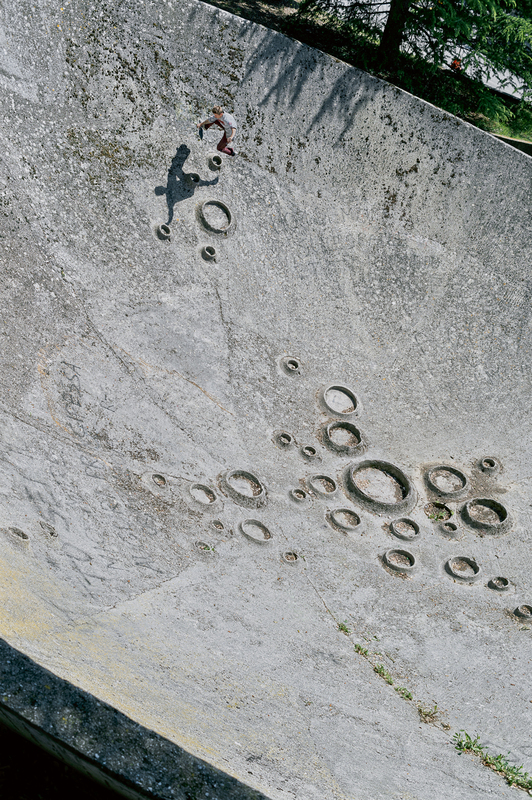 Frontside wall bash, Paris. Ph: Thibault Le Nours. Speaking of small brands, you skated for Witchcraft and before that for Warriors, two small European brands, but when you were younger you got an offer from Element and you turned it down. Do you regret it? To be honest sometimes I feel like I threw away a possibility, but I was very young then and I obviously didn’t see things the way I see them now. I wouldn’t say I regret my choice though. I am glad I grew up skating for Warriors; it was really nice to travel and be involved in skate projects with my friends, and I believe that, even if on a local scale, we got to do some really cool things. Before you were talking about the confidence you got in skating big parks, but I know you also skate street spots, would you call yourself a transition skater? No, not really, I don’t think that we need to define skateboarding along those lines, but it is true that I am more comfortable skating anything that is inclined whether it is a bank or a transition. Do you think that being a skater that prefers to skate transition and banks has limited your possibilities of having a career in skateboarding in this time and space? No. I believe that in skateboarding there still is space for all kinds of skating, you don’t necessarily have to conform to a certain trend. I do think it’s important to try and not limit yourself though. It’s important not to skate only one type of spot, no matter how good you can do it. It is always interesting to see somebody bringing his or her skills out of their comfort zone; that is often when the most interesting tricks happen. Also, the new generation of skaters can do it all; I think that is where the future is. Switch ceiling bash, Paris. Ph: Thibault Le Nours. What do you think about transition skating today? I feel like bowl skating, aside from the big contests, has been a bit ignored, especially by the media. I agree, I noticed that transition skating has gotten less space in the media lately. I can’t really think of a reason why it is like that, maybe it’s due to the fact that there are way more kids skating the street than there are kids skating transition. Or maybe it’s due to the fact that we have this unwritten rule in skateboarding that ‘skateparks are not cool’ and that makes it hard for transition footage ‘cause you either have to skate some crazy transition spot or skate a pool, which we don’t have in Europe. Do you agree with the rule ‘skateparks are not cool’? Not really. Of course generally street spots are more interesting and good-looking, but there are also some iconic parks that are always enjoyable to see people shred. They allow you to do tricks on things that you’ll never find anywhere else, so you’re able to do some tricks that would not exist if not there. Plus I grew up watching videos where people would skate all kinds of stuff and mix together street and park, and I’ve always liked that; I feel there is always going to be space for that. Speaking of videos. You are an eighties skate fan… You watch a lot of old videos right? Yes, I love to watch vert skating footage from the 80s. They didn’t do that many tricks, but they performed every trick they did so often they got to do it in the best way you could possibly do it. I try to watch everything I can. I am pretty sure I watched all the videos from that period that are available on the Internet. How did you get interested in 80s skateboarding? I wanted to learn a bit about the history of what we do; I wanted to see some sides of skateboarding that I didn’t know. And at some point I wanted to start skating bigger transition and vert. I was looking for something that would get me hyped on doing that type of skating and I found what I needed in video parts from guys like Mike Frazier. It also fascinates me how much skateboarding was different back then and yet how much it influenced today’s skating. I recently saw somebody doing a stylish powerslide on a bank and it looked really similar to one of those 80s powercarves you would do under the coping. I think we can leave it at that, thank you for your time and get well soon.